From Full Farm to Rustic Chic - Bringing Farm To Table! If you’re following any wedding website, social media or Pinterest, then you know the Farm look is in! Whether it is brought in with a chair, table or both, it’s a great touch of rustic. I often have brides who are worried their big day might look too rustic. Don’t get me wrong, you easily can make a wedding 100% rustic, but with the right touches, you can transform the look to be very romantic. The farm chair is a great way to bring a rustic element in to a girly look. At this event, we paired our chair with the Mink Giselle linen with a white tooling overlay. 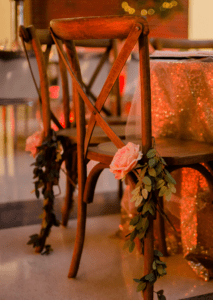 With also added pink flowers, with greenery, to the right leg of each chair. The flower and tooling adds in a softening touch, to both the girly and rustic look. Accent pieces are the best way to bring in the rustic look, if you just want a touch of rustic. 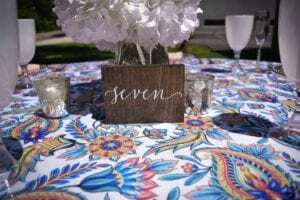 We added in a dark wood stained table number to this bright paisley linen! Another great way to subtly bring a rustic touch onto the table is to add wood stumps underneath the floral arrangements. Our Mahogany Colonial table is a great statement piece for any event. 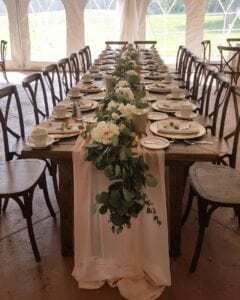 We have paired it with farm chairs and a garland runner to our white infinity chair with Tiffany accents! It truly can go either way. For this shower, we softened the dark stain with a white chiffon runner and pearl glass chargers. Want 100% farm? This is the look for you – farm chairs with farm tables! The best part about this look is that it works year round. The accent colors and centerpieces can really help shape this look to be exactly what you want! 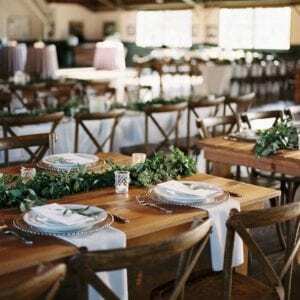 Wanting to add farm tables or chairs to your big day? June is a great month to start booking items for your big day! We are currently offering some great farm specials. Click Here for more information!